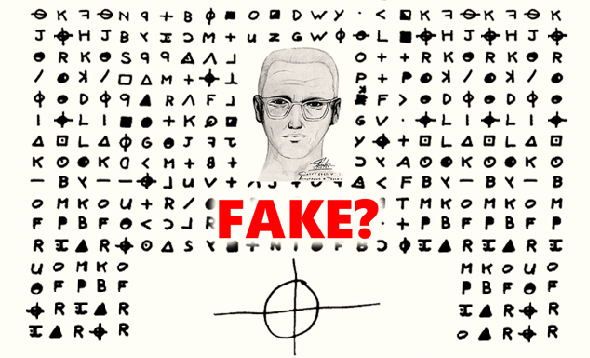 Is the second Zodiac Killer message a fake? As can be seen, Z340 associates with the fake ciphers. 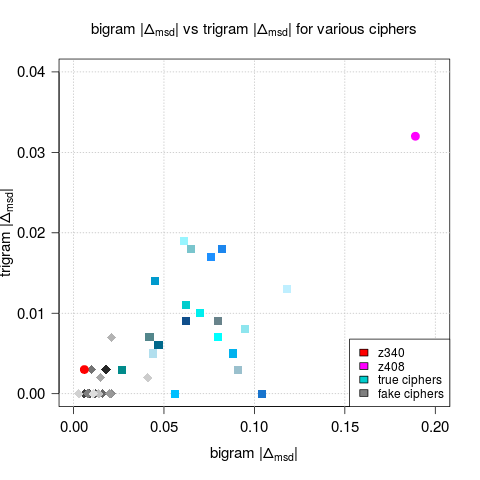 Interestingly, the other true ciphers form their own cluster, away from Z408, implying that the encryption mechanism used for them is a lot stronger than the encryption mechanism of Z408. A fake or not a fake? Other tests Juzek describes in his paper strengthen the nonsense hypothesis, too. Nevertheless, Juzek’s work is not a proof that Z340 is a fake cryptogram (and Juzek doesn’t claim that it is). 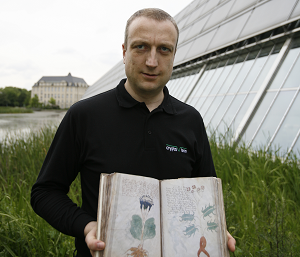 However, Juzek has delivered some interesting evidence that supports the hoax hypothesis. Generally speaking, the nonsense hypothesis appears to make sense. I can well imagine that the Zodiac Killer wanted to create an unsolvable crypto mystery, after his first encryption had proven weaker than he had expected. Perhaps, to be on the safe side, he decided to create an encrypted message that is unsolvable because there is no solution. If you follow Juzek’s arguments or if you have a different opinion about Z340, please let me know. Transpositions disrupt the normal occurrences of repeating ngrams, so you have to reverse the transposition operations before counting up the ngrams. I’m really curious what Juzek’s analysis would yield if it also considered a wide variety of transposition methods. What effects would this have on the mean squared distance measurement, and how would it compare to known “true” transposition ciphers? I should add that Juzek acknowledges the transposition possibility in the addendum of his blog post. Es sind im Text einige putzige Stellen, wie z. B. in der letzten Zeile “Z O delta A I K”, die wohl dazu verleiten sollen, sich näher mit dem Chiffre zu befassen. ich habe mir den Brief mit dem Zodiac Code mit „my name is“ angeschaut und durchdacht. I ran this cipher in AZ Decrypt as a slice selection in the form of a 4 line “rail fence” cipher. The software returned a seemingly randomized sequence of the “th” digraph. Each digraph was followed by a random vowel or two, an occasional consonant, then another “th” digraph, over and over again. I get the same result as a 3 line fence cipher. If not some decoding error with the software itself, I am at a loss to explain it. If the cipher is a fake I would have expected much more randomness. So why the “th” digraph repeated over and over and over?